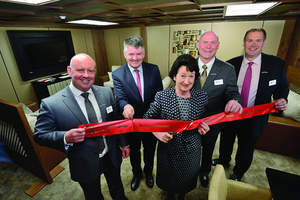 SOURCE: Universal Weather and Aviation, Inc.
SHANNON, IRELAND--(Marketwired - Jul 27, 2015) - Universal Aviation Ireland - Shannon, located at Shannon Airport (EINN), announced the complete renovation of its FBO. The update to the FBO, includes a renovated VIP departures lounge as well as all new crew and operations offices. "Our focus is always firmly on our customer, and leaving them with a memorable experience on the ground," said Derek Collins, General Manager, Universal Aviation Ireland - Shannon. "We have listened carefully to our clients' feedback, and we're proud that we have enhanced our FBO with the features and amenities they requested." Traffic at the FBO (which has been open since May 2003), continues to grow, and Universal Aviation has worked closely with Shannon Airport to promote the airport's value-added services, such as United States Customs & Border Protection pre-clearance. According to Neil Pakey, Chief Executive Officer, Shannon Airport, Shannon's U.S. pre-clearance facility is the only one of its type in either Europe or the Gulf region and offers business jet operators the opportunity to pre-clear Customs & Immigration to the U.S., and proceed directly to their destination within the U.S.
"Universal Aviation is a key partner in the development of our Centre of Excellence for Business Aviation," said Pakey. "Universal's new lounge is a high-quality and timely addition to the services available at the airport, and we credit Universal Aviation for investing in this way. We look forward to continuing to work successfully with Universal Aviation in the years to come as we jointly develop more business aviation activity at Shannon." "Shannon is known for being an excellent tech stop, but it is also an increasingly popular destination," said Sean Raftery, Managing Director Universal Aviation UK and Ireland. "This renovation is just the latest in our ongoing commitment and investment to enhancing our clients' experience at strategically important locations throughout Europe and the world -- whether through full ground handling facilities or highly customized supervisory services." Universal Aviation is the ground support division of Universal Weather and Aviation, Inc. Universal Aviation has more than 40 locations in 20 countries, including 11 in Europe. Universal Weather and Aviation, Inc. has the knowledge and expertise to accomplish our shared purpose: the success of your trip. Our comprehensive resources include customized trip support, convenience through the UVair Fuel Program, worldwide ground support, online flight planning, and data link, in-flight catering via our wholly-owned subsidiary, Air Culinaire Worldwide, and more. Universal Aviation, the ground support division of Universal, has more than 40 locations in 20 countries, and is known for adherence to standards for consistent, professional, personalized services, and regional expertise. Multilingual staff members provide solutions including UVair® fuel, credit for approved customers, trip planning, and more through Universal. For more information, contact worldwide sales at +1 (800) 231-5600 ext. 3300 (North America) or +1 (713) 944-1622 ext. 3300 (Worldwide). About this company Universal Weather and Aviation, Inc.
Universal Aviation Ireland - Shannon cuts the ribbon on renovated FBO. From L-R: Sean Raftery, Managing Director Universal Aviation UK and Ireland; Neil Pakey CEO Shannon Group; Rose Hynes, Chairman Shannon Group; Derek Collins, General Manager, Universal Aviation Ireland - Shannon; Craig Middleton, Regional Director, Europe, Middle East, Africa, Universal Aviation.